If you are here you are most likely having a problem with honeybees. The bees have either invaded the walls or ceiling of your home or they have swarmed on or in a tree near your home. Don't worry, we are dedicated to helping you by providing professional swarm and established colony removal. We want to remove and preserve the honeybees that may have taken up residence on your property. We are bee keepers who enjoy the art of beekeeping and have made it part of their life to preserve and protect the honeybee. Honeybees are a precious resource that deserves our help. 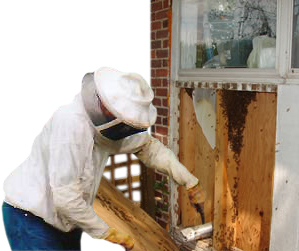 Removal from structures and outside locations should be done by a professional who has the equipment and knowledge necessary to pinpoint the location of the honey bees and properly remove the bees. As many as 30,000 to 80,000 bees could be in your ceiling or walls. Don't put yourself in danger, call us today.